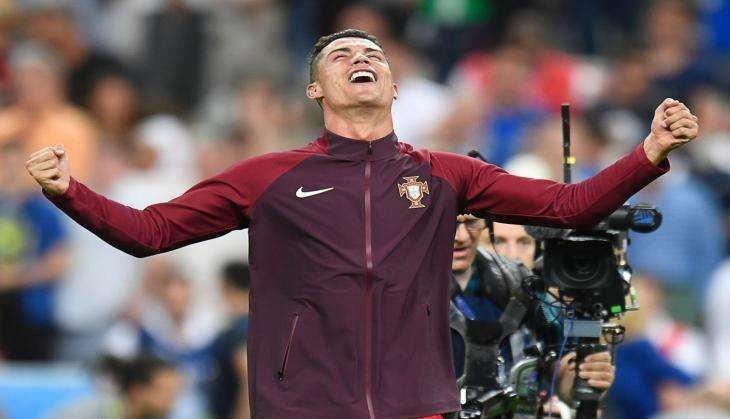 Portugal skipper Cristiano Ronaldo, who is basking in the glory of his team's successful successful Euro 2016 campaign, has said that his team's 1-0 win over hosts France has helped prove their critics wrong. After both sides failed to score goals in regulation time, substitute Eder struck the match-winning goal for Portugal to ensure his side finish their Euro 2016 campaign on a winning note here at Stade de France on Monday. The match also saw skipper Ronaldo subbed in the 25th minute of the match, eight minutes after injuring his knee in a clash with France's Dimitri Payet. Lavishing praise on his side, the Real Madrid striker insisted that Portugal truly deserved the victory after struggling for so many years. Ronaldo also revealed that he had a gut feeling that Lille striker Eder would score a winner for Portugal. "Portugal have deserved this after many years of sacrifice. No one believed in us," Ronaldo was quoted as saying by goal.com. The 31-year-old star striker said that he was deprived of winning something with the national side while adding that he was happy to achieve the same now. "I had already won everything with clubs. I lacked something with the national team." he added. The victory has somewhat erased Portugal's harsh memories of the Euro 2004 final defeat to Greece, which left the Real Madrid striker crying on the pitch.